The range of SMP strongroom doors come with a variety of specifications depending on the level of security needed and the building restrictions. 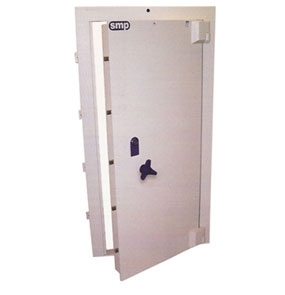 These strongroom doors provide protection for documents and valuables with cash ratings between £3000 and £10,000 in situations where a room sized safe is necessary. Door will fit a standard wall thickness of 229mm/305mm/356mm or special thickness to suit customer requirements. A randomly positioned live re-locking device is fitted giving protection against explosives or force. The outer plate is 6mm thick, reinforced to 12mm around the edges. The total thickness is 142mm. Grille gates and vestibules are available as extras, contact our security team on 0117 9674994 to find out more. Total thickness of the door – 160mm. Boltwork is secured by either a seven lever, anti drill key lock or a four wheel keyless combination lock. 00mm x 100mm x 12mm angle with a flat bottom bar. Contact our knowledgeable team at Thornhill for further advice and help with our range of strongroom doors by calling 0117 9674994. Don’t forget, we offer free delivery to site at an address on the UK Mainland, or contact us for a quote to have our qualified engineers fully install your safe.